Rachelle Vinberg is from Long Island. She skates the Bustin 8.0″ Street Series. Rachelle is in NYC every weekend and will be moving into Brooklyn for college this September. We’re looking forward to having her shred with the rest of the Bustin Street Crew. Rachelle will also be helping teach SURE Skateboards lessons starting in September. Lots of Freshness will be pouring out of the NYC team this summer, give @bustinstreetcrew an Instagram follow to stay in the loop. 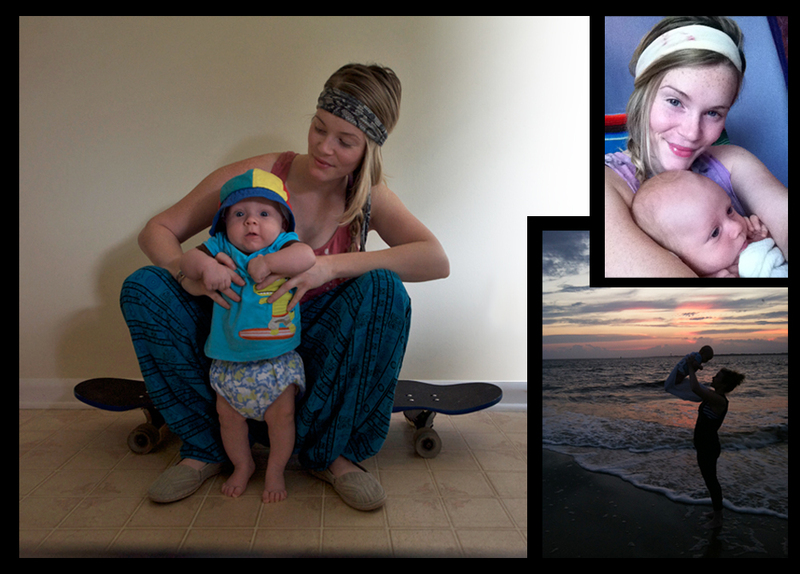 SURE Skateboards Instructor, Maribeth McHugh, takes a break from teaching to start a new family. If you are a longtime friend or follower of SURE, you probably are familiar with Maribeth McHugh, marathon push skater and super popular SURE instructor for two plus years. Maribeth gave birth to a healthy baby boy this past May. The little guy’s name is, Torus Jackson, TJ for short. Maribeth and TJ’s daddy, Jeffrey Vyain, moved from Brooklyn down to Hagerstown, Maryland to start their life with TJ. Hagerstown offers nearby rural outskirts and a better opportunity to live a holistic lifestyle, something dear to both Maribeth and Jeff. Maribeth in an appearance on the cover of NYC’s FRESHPAVED magazine earlier this year. What’s next for Maribeth? MB has recently started to get back on her board to do some casual distance skating. How could she not? Living with Jeff Vyain, a world class marathon distance skateboarder and the product designer for Bustin Boards, all things skateboarding are never far from this young family. In addition to riding again, Maribeth will also be doing some writing for Concrete Wave magazine. Reaching into her archive of experiences as a skate instructor and Longboarding New Yorker, MB will find inspiration to share with Concrete Wave’s global audience. This is an amazing new journey for Maribeth, Jeff and Torus Jackson. SURE Skateboards will be keeping them close and constantly in mind as new horizons open up to spread the stoke and keep skateboarding accessible for everyone to enjoy. 16 year old Bronx, NY resident DeJaune Jones is making waves and turning heads in a mostly west-coast dominated downhill skateboarding scene. 16 year old, Highbridge Bronx resident, DeJaune Jones has been making a splash in Downhill Skateboarding locally for a couple of race seasons. Downhill racing has been growing rapidly out of the Longboard segment of the skate industry for several years now. Dejaune took 2nd place in the Junior division of the Guama Downhill race back in January during a trip to Puerto Rico. In April, DeJaune proved himself as a threat to racers of all ages by winning the Pro Open division at New Jersey’s own Major Stok’em. Up until recently, 50 plus mile per hour downhill skateboarding was largely dominated by racers from the west coast of the United States and Canada. DeJaune recently opened a lot of eyes by taking the Junior’s division first place spot at the Maryhill Festival of Speed in Goldendale, Washington, the USA’s largest and most famous race. Maryhill had serious racers of all ages attending from all over the world. 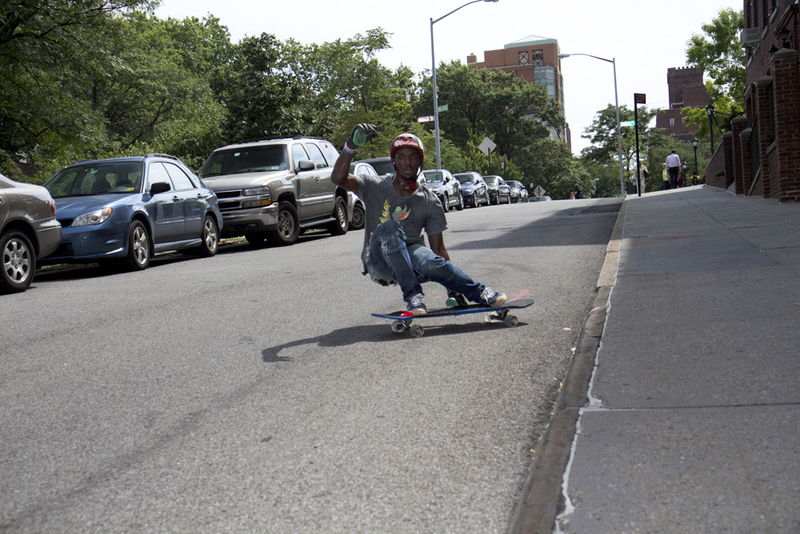 DeJaune demonstrates Free Ride sliding techniques on a Brooklyn hill. Photo, Rob Rodrigues. Downhill skateboarding takes nerves of steel and fierce technical control, racing down a hill in a tight competitive pack is very dangerous and requires athletic skill, conditioning and training. New York City is a part of the country that is relatively flat compared to other mountainous regions. DeJaune spends a lot of time taking day and weekend trips out to hillier parts of the tri-state area in order to try and simulate the speed conditions he will be facing as he starts to attend more top tier competitions. DeJaune is sponsored by several equipment manufactures including Brooklyn’s own Bustin Boards. Bustin has been growing fast as a skateboard and longboard company and has been working closely with several talented young riders to establish a global presence with equipment and skate talent. The company’s focus on developing longboard products geared towards downhill skating along with their sponsorship of dozens of East Coast events is one of the reasons that the sport of downhill skateboarding has begun to flourish amongst east coast riders. With a focus and commitment, Dejaune has a potentially amazing career ahead of him in a growing discipline that is also proving to be an exciting spectator sport. Skateboarding recently received an amazing sign of acknowledgment in one of New York City’s greatest parks. 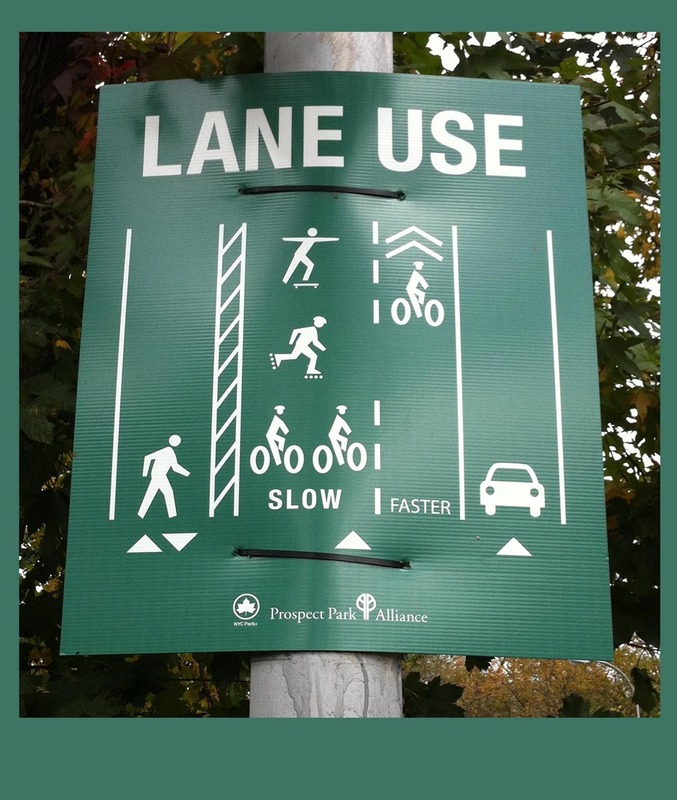 Brooklyn’s Prospect Park Alliance has posted a series of new signs around the park’s main drive. The signs indicate revisions to lane use and traffic flow throughout the 3.35 mile Park Drive. A symbol of a skateboarder surprisingly appears on the new signs. This brings skateboarding as a means of transportation to a new level. Perhaps Alternative Transportation enthusiasts are taking the first steps in embracing the massive explosion of skateboarders using bike lanes and city streets to get around New York. 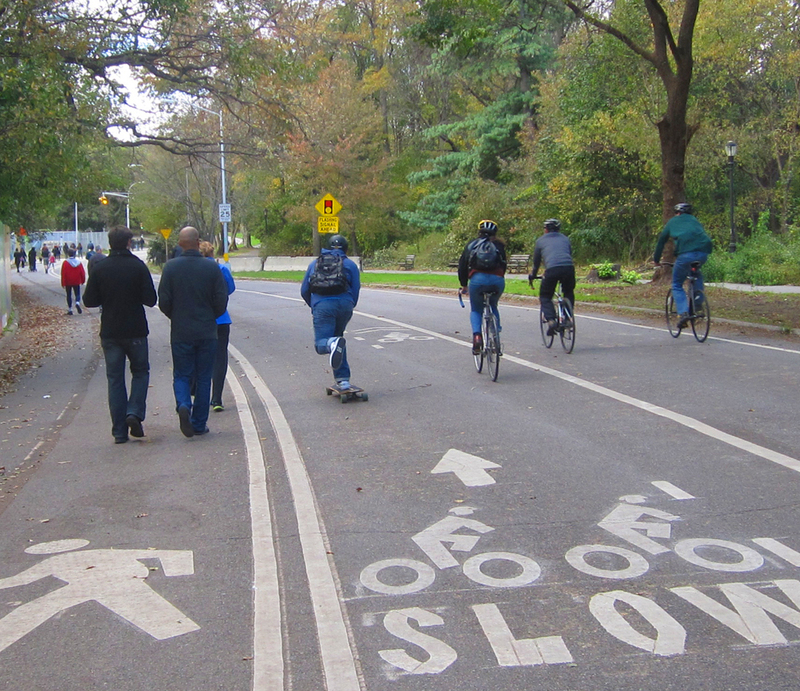 A skateboarder appears as a symbol on a series of new signs around Brooklyn’s Prospect Park. As a lifelong skateboarder and an advocate of alternative transportation, I have some constructive comments for the new SK8 Icon. Helmet – The skateboarder is the only image not wearing a helmet in the bike lanes. The skateboard – the board and wheels below the rider could be a little more prominent, slightly longer and with larger wheels. That would help make the image more universally understandable. Body Stance – I have never witnessed a skateboarder keep both arms completely horizontal and the pushing leg totally straight. The rollerblader body image is very much more indicative of what a skateboarder in transit would look like. Skateboarders Urban Riding Environment – Rob Rodrigues tests out the new lane on his way into Manhattan from Brooklyn. Regardless of the minor criticism, the new signs are a big step forward. The New York city parks department has done a great job providing skateboard parks in several communities throughout the boroughs. The skate parks are always free for the public to use but only offer appeal to skaters interested in tricks and hazardous maneuvers. Skateboards, when thought of as a mode of transportation hold a greatly broader appeal to people of all ages. Skate legends Steve Caballero & Christian Hosoi have a poolside laugh. 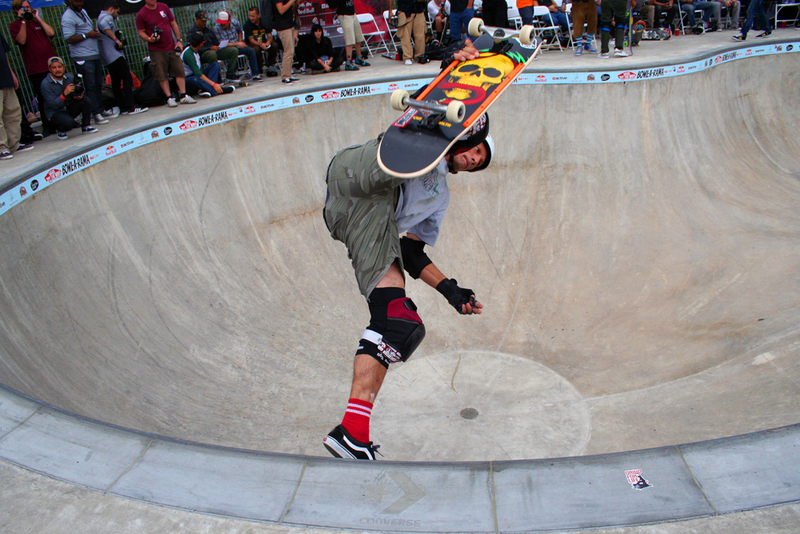 Pier 62 skate park was host to the Vans Bowl-A-Rama this past weekend. The Pro division was amazingly fast and technical. The crowd was also treated to the Masters division. These are the guys that laid the innovative groundwork for today’s generation. It was great to see them still ripping. Check out some of the photographs I was able to snap from their final heat. Pro Winners; 1st – Pedro Barros, 2nd – Alex Sorgente, 3rd – Ben Hatchell. Masters Winners; 1st – Lance Mountain, 2nd – Steve Caballero, 3rd – Eddie Elguera, 4th – Christian Hosoi. Mike McGill launches a MASSIVE Foot Plant out of the 10′ deep end. Christian Hosoi reentering from a fully committed Layback Grind. Eddie “El Gato” Elguera rips a super stylish & controlled Backside Nose Grab Air. Steve Caballero – Also in town to celebrate the 20 year anniversary of his Vans signature Half Cab sneaker, takes flight off the hip with a Frontside Air. Chris Miller – Frontside Lip Slide. Lance Mountain – First place Master’s Division. Mike McGill – Inverted Handplant Air. Check out video coverage on the Vans website.